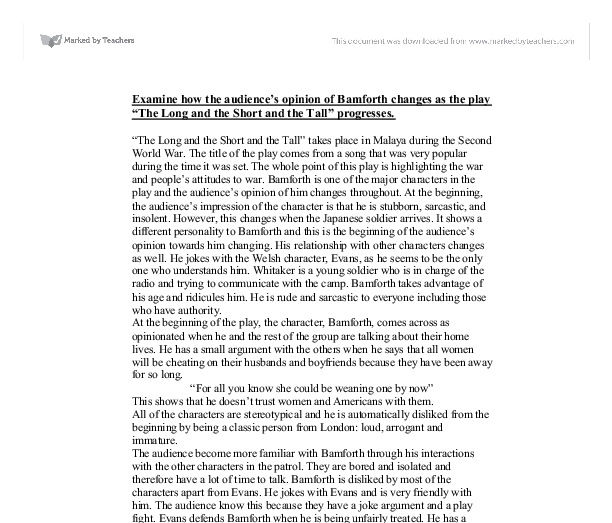 Examine how the audience's opinion of Bamforth changes as the play "The Long and the Short and the Tall" progresses. "The Long and the Short and the Tall" takes place in Malaya during the Second World War. The title of the play comes from a song that was very popular during the time it was set. The whole point of this play is highlighting the war and people's attitudes to war. Bamforth is one of the major characters in the play and the audience's opinion of him changes throughout. At the beginning, the audience's impression of the character is that he is stubborn, sarcastic, and insolent. However, this changes when the Japanese soldier arrives. It shows a different personality to Bamforth and this is the beginning of the audience's opinion towards him changing. His relationship with other characters changes as well. He jokes with the Welsh character, Evans, as he seems to be the only one who understands him. Whitaker is a young soldier who is in charge of the radio and trying to communicate with the camp. Bamforth takes advantage of his age and ridicules him. He is rude and sarcastic to everyone including those who have authority. 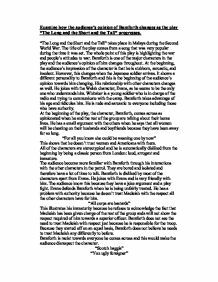 At the beginning of the play, the character, Bamforth, comes across as opinionated when he and the rest of the group are talking about their home lives. ...read more. When the Japanese soldier arrives at the hut, Bamforth is the only person to step forward to kill him. All the other characters refuse to murder the soldier including Macleish. This would come as a surprise to the audience as it shows that when it comes to killing, the rest of the patrol hasn't the courage. This is ironic because they are all in war conditions but the troop refuse to kill the prisoner. "Here. Give me a hold. It's only the same as carving up a pig. Hold him still" When Bamforth starts to attempt to kill the prisoner, he unfairly gets into trouble when Mitchem stops Bamforth. This makes the audience feel sympathy for Bamforth because he got into trouble by only doing what he was supposed to do in war conditions. This part of the scene shows Bamforth's courage. Because of this, the Japanese soldier is a dramatic device in the play. The audience may be beginning to change their views on Bamforth at this point because Bamforth's personality is being shown differently: brave and strong. Bamforth is now given the job of looking after the Japanese soldier. This gives him the responsibility that he needs. Whilst looking after him, he ridicules the prisoner's accent. ...read more. By this time, the Japanese soldiers are coming to get the troop. Mitchem tries to kill the soldier but Bamforth stands in the way. This shows bravery, as he was willing to die for what he believes in. This gains the character more admiration from the audience. This is ironic because he was the only one who was willing to kill him at the beginning and now he was standing up to protect him. He argued about the prisoner with Mitchem for several minutes and wouldn't move out of his way. This gave the Japanese time to attack. In the end, the Japanese troops kill all of them. The audience are left wanting questions answered. Is Bamforth wrong to defend the soldier and stand in Mitchem's way? I think he was right in standing in his way because he was standing up for what he believed was right and he was protecting someone who he obviously cared about. Who is responsible for the Japanese catching them? I think that Mitchem and Bamforth are responsible in some way. Firstly, if they were going to kill the soldier initially, they should have done it at the beginning rather than after Bamforth has got to know him. Secondly, Bamforth is responsible as well because as they are in war conditions, they have to make sacrifices to save their own lives. In the end, the writer leaves the audience thinking that Bamforth was brave and decent. ...read more. Bamforth resents order and those who follow it. Johnstone likes his power and doesn't like Bamforth trying to fight the system. Macleish is a believer of the rules and dislikes Bamforth's obsession of being unruly. Willis Hall uses many dramatic devices such as: the cigarettes and cigarette case that the prisoner has, the photographs of the prisoner's family back in Japan and the very ending of the play. Despite this warmth, Kate is still capable of supporting Joe in his deceit. She is involved in a battle with Ann Deever because Ann was Larry's fianc�e but now wants to marry Chris. Kate can't let her because that would mean admitting that Larry was dead. and describes him as a 'creature' with no sense of ordinary duty...Does he care? ', with the character that Gerry is, the unreliable father, it gives Kate to emphasis to the audience that men are unreliable, and makes an example of him. not my beautiful sister ...' We decided against using slow motion as this would make the crash less stylized and detract from the professional look of the performance. We also decided against using narration as we thought there were more creative ways to portray the crash. For humour I am going study the end of act I. In the middle of Act I, a Japanese soldier is spotted walking towards the hut. The soldiers all hide however confused Whitaker leaves the radio set on the table.